This recipe is fantastic for Sunday roast dinners and it makes enough to feed all of the family. Try this rich pheasant recipe with champ or bubble and squeak cakes. Finely slice the apples and finely slice the onions. Heat the oil in a large saucepan or a large baking tin and brown the pheasants on all sides. Scatter the apples and onions in and around the pheasants, putting some inside the birds. Pour the apple liquid over the pheasants, apples and onions. If using brandy, flame the brandy and shake the pan ever so slightly until the flames subside and disappear. If not, leave the flaming out. Dust the pheasants with the nutmeg, herbs and a healthy pinch of black pepper. Cover the tin with foil. Place into the oven and cook for one hour. Transfer the juices from the cooking tin into a saucepan, add the cream and simmer for five minutes. Keep the pheasants and accompaniments warm in the oven. Serve the sauce poured over the pheasants. This recipe serves eight people. 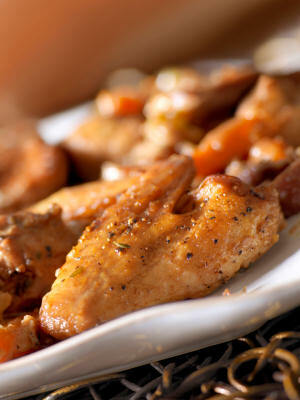 You could also put some carrots and parsnips into the base of the pheasant to cook – they will be sweet and delicious. Awesome! Simple to follow and delicious. Calvados a must! Summary: This recipe is fantastic for Sunday roast dinners and it makes enough to feed all of the family. Try this rich pheasant recipe with champ or bubble and squeak cakes.